In 1887, twenty two years after the assassination of President Abraham Lincoln, his coffin was dug up and opened because there were constant rumors that his body was not in the grave. So they dug it up and the body was there. The rumors continued; so 14 years later, they had to dig it up again. Both times, witnesses were present who testified that Lincoln was still in the grave. Three days after the death of Jesus Christ, similar rumors began to spread throughout the land of Israel. Only this time, there were no witnesses who could say that they had seen His body. 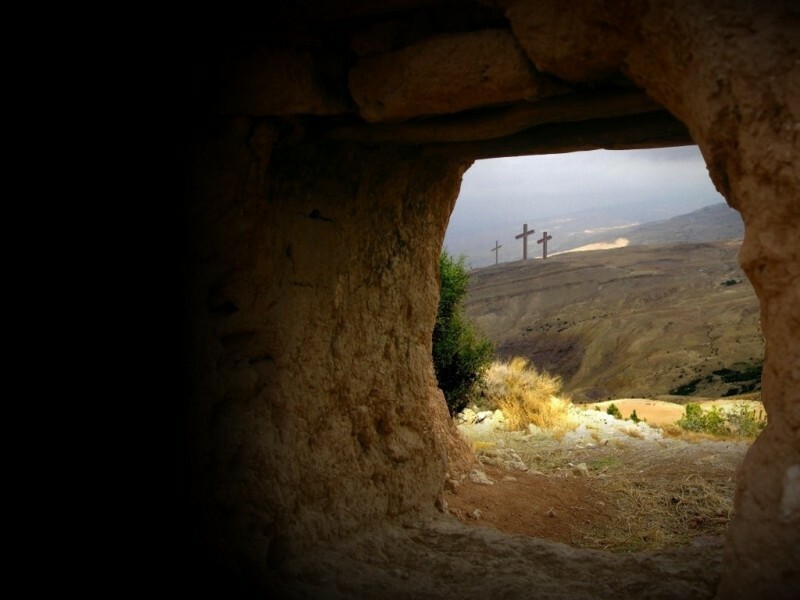 In fact, to the contrary, many witnesses claimed to have seen him out of His grave and even talked with Him after the resurrection. As great a man as Lincoln was, there were witnesses to prove he was still in the grave. If one of our Presidents or another leader were to cry out today to Lincoln for help, there would be no response. If a scientist were to cry out to Einstein for help today, there would only be empty silence. If someone were to call out to Mohammed or Buddha or Gandhi today, there would be no help. But if you and I call out to Jesus Christ, there is instant power available to us... power to change our lives ...why? Because the grave is empty! Jesus is risen and He is alive! On this Resurrection morning, we will be looking at the power of the Resurrection in the life of the Christian: in our past, in our present, in our future. And if you are not a Christian, the power of the Resurrection can become yours through faith in Jesus Christ. 1 Peter 1:3-9 Blessed be the God and Father of our Lord Jesus Christ! According to his great mercy, he has caused us to be born again to a living hope through the resurrection of Jesus Christ from the dead, to an inheritance that is imperishable, undefiled, and unfading, kept in heaven for you, who by God's power are being guarded through faith for a salvation ready to be revealed in the last time. In this you rejoice, though now for a little while, if necessary, you have been grieved by various trials, so that the tested genuineness of your faith—more precious than gold that perishes though it is tested by fire—may be found to result in praise and glory and honor at the revelation of Jesus Christ. Though you have not seen him, you love him. Though you do not now see him, you believe in him and rejoice with joy that is inexpressible and filled with glory, obtaining the outcome of your faith, the salvation of your souls. We shouldn't think of this as merely symbolic language. When we talk about experiencing a "new birth", or a new life, we don't simply mean turning over a new leaf, or having a change of heart, or gaining a new perspective. The new birth in a Christian's life is an event just as real, just as objective, just as dramatic, as the Resurrection of Jesus from the dead. If you are a Christian, you have experienced this new birth. It is a miracle. You have been "born again" and you actually feel alive for the first time in your existence. God has moved you from death to life by exerting in you the same power that He used to bring Jesus back from the dead. A real change has taken place. You have a new heart and a new nature: a heart that is now alive to God; a nature that now wants to please Him. Everything that went before, whatever you are most ashamed of, whatever blasphemies against God you committed, whatever hurts you inflicted on others or yourself—the Resurrection power of Jesus Christ has removed all those things. They are gone; they are no longer part of your new life. This is God's mercy. You haven't done anything to deserve it. Because of this new birth, instead of an expectation of God's wrath, Peter says in verse 4 that you can now look forward to an inheritance from Him. When you were born again, you were born into God's family, and you become His heir. Since you are now His child, you have a share in the family fortune. This inheritance is imperishable, undefiled, and unfading, kept in heaven for you. It's good to know in these uncertain times that our inheritance is not kept in the bank or invested in the stock-market. Nothing can devalue this precious inheritance. However fragile our earthly banks are, the “Bank of Heaven” remains secure. And so, you have moved from having no hope (except the prospect of death and judgment) to being a person with a living hope: a hope that encourages and sustains and upholds you. If you are a Christian, then this has already happened in your life. If you are a Christian, you want to live out this new life that God has given you. You want to fight sin every day, because sin belongs to your old life. You want to love God and please Him. You love to read your Bible, because it feeds your hope and helps you to know Him, whom you love. And you want to pray to your Father, because you have a living hope, a relational hope, and an intimate love relationship with Him. God's resurrection power has acted in the past of every Christian to give us a new birth into a living hope. If you are not a Christian, then you are still dead in your sin and you need this new birth for the forgiveness of your past sin, for hope in this life, and for eternal life. Next, Peter moves on to the present experience of God's resurrection power in the life of the Christian. In verse 5, he describes believers as those who by God's power are being guarded through faith. Peter is writing to encourage Christians who are facing trouble and persecution. In the next verse, he says that they have been grieved by various trials. Peter's encouragement to us is that, whatever our circumstances look like, we are being guarded by God's power. God does not take us out of suffering, but He assures us that He is with us and we are kept and guarded by Him through it. When the Christian is faced with trouble, or sickness, or hardship, or persecution, he is assured: God's power raised Jesus from the dead; so surely He is powerful over this as well. And this is what Peter assures us: your suffering, your trials, your grief are not out of God's control; they are part of God's plan. He is preserving you, refining you, fitting you to know Him more intimately. This is a deep truth founded on the Resurrection of Jesus. God was sovereign over the suffering and death of Jesus. He planned it and He allowed it. No one took Jesus’ life—He laid it down willingly and raised it up after 3 days. After all His amazing miracles, Jesus demonstrated His absolute power and sovereignty by rising from the dead. He is seated at the right hand of the Father and guarding you by that same power and authority. 1 Peter 3:18-22 For Christ also suffered once for sins, the righteous for the unrighteous, that he might bring us to God, being put to death in the flesh but made alive in the spirit, in which he went and proclaimed to the spirits in prison, because they formerly did not obey, when God’s patience waited in the days of Noah, while the ark was being prepared, in which a few, that is, eight persons, were brought safely through water. Baptism, which corresponds to this, now saves you, not as a removal of dirt from the body but as an appeal to God for a good conscience, through the resurrection of Jesus Christ, who has gone into heaven and is at the right hand of God, with angels, authorities, and powers having been subjected to him. Since the Resurrection places Jesus at the right hand of the Father, then nothing is outside His power. It is this risen Jesus who is guarding us from the evil and darkness around. So, if you are a Christian, you see all that happens to you as ways that God is working in your life to strip away your worldliness, to strip away your pride, to strip away your self-reliance. You look for the ways He is testing and building your faith through it. This is how He is guarding you and fitting you for a future with Him. If the Resurrection of Jesus had not happened, all your pain would be meaningless. But because of the Resurrection, you can be confident of His sovereignty over all of your life. This is faith: to continue to trust that God is guarding you whatever your circumstances. If you are a Christian, you believe, whatever horrible situation you face: God's power raised Jesus from the dead; therefore, God's power will guard me now. If you are a Christian, your life is not filled with worry or fear or anger. Your confidence in the Resurrection of Jesus gives you the gift of verse 8, Though you have not seen him, you love him. Though you do not now see him, you believe in him and rejoice with joy that is inexpressible and filled with glory. God's Resurrection power acts in the present of every Christian to guard us from lasting harm and fills us with joy and love for God and others. Therefore, we see that the Christian has been saved from the penalty of sin. The Christian is being saved from the power of sin. But the climax of the working of God's Resurrection power is still in the future. And one day the Christian will be saved from the presence of sin! This is what Peter is talking about in verse 5: a salvation ready to be revealed in the last time. This is what God is guarding us for. The Resurrection allows us to be filled with God’s power, the Holy Spirit. Because God is in us, we are guaranteed a better life to come, where we will see Him face to face and enjoy the pleasure of His presence forever. However hard and pain-filled our life is now, we look forward to a life to come in which there will be no more death, mourning, crying, injustice, or pain. The Resurrection of Jesus Christ guarantees our future salvation. Jesus was raised to life, He lives in us, and He will come back to take us home. 1 Corinthians 6:14 And God raised the Lord and will also raise us up by his power. The Christian lives in anticipation of this day, who by God's power are being guarded through faith for a salvation ready to be revealed in the last time. If you are a Christian, the certainty that you have a guaranteed eternity of joy ahead of you shapes everything you do today. You don't invest your time and effort in all the things of this world that are only temporary: you invest your life in knowing and serving Jesus, whom you will be with forever. You don't put all of your effort into your job; you don't spend all your money on your house; you don't waste your life in front of the television or a computer. All that is destined to be burned. You invest your time in loving and serving others, in building up the church, in preparing to be with God. You don't invest in the things of this world; you invest in glory. Another thing: if you are a Christian, you do not fear death. For you, bodily death is merely the doorway to life. It's the power of the Resurrection again. The only thing death can do to us is to fulfill our longing to be in the presence of Jesus. God's Resurrection power acts in the future of every Christian to reveal the salvation for which we long. So we find in these verses a glorious condensed portrait of the power of the Resurrection at work throughout the Christian life: what God has done in the past in giving us a new birth; what God is doing right now in guarding our faith; and what God will do in the future in giving us life after death. No wonder Peter begins his letter with this explosion of praise: Blessed be the God and Father of our Lord Jesus Christ! After all, imagine being Peter the day of Christ’s crucifixion. Imagine being Peter on that long Passover Saturday. His past haunted him. Everything he'd put his hope in had been nailed to the cross. Even his pride was stripped away: he had denied Jesus three times. How bleak was his present, filled with numbness, bewilderment, grief, and emptiness? What lay ahead in the future? Back to the fishing boat it seems. It's a far cry from the glorious kingdom he'd pinned his hopes on. At that point, Peter was totally hopeless. Now, imagine being Peter on Resurrection morning, when he heard the unbelievable news from the women, and ran breathlessly to the tomb to see for himself. It was empty! Now, his past made sense! Now, he had a reason to live! Now, he had hope for the future! Jesus was raised to life, and His Resurrection power would transform Peter's life when the Holy Spirit filled him. No wonder he exclaims Blessed be the God and Father of our Lord Jesus Christ! If you are a Christian, this same Resurrection power is at work in you, too. In your past: Jesus behind you. In your present: Jesus inside you. In your future: Jesus before you. It should make you shout praises to God, too! Today is a day to celebrate! Jesus is alive! How do I know? He lives within my heart! I have a living hope abiding in me! If you are not a Christian, then you have no hope, but I have good news! All this can become yours if you believe in Jesus Christ as the Son of God and His work on the Cross to atone for your sin. Repent of that sin and give your life to Jesus by making a public confession and dying to self in baptism. Then you will be born again of the Holy Spirit and the Resurrection power of Jesus Christ will change you. Jesus will be alive in you, too!